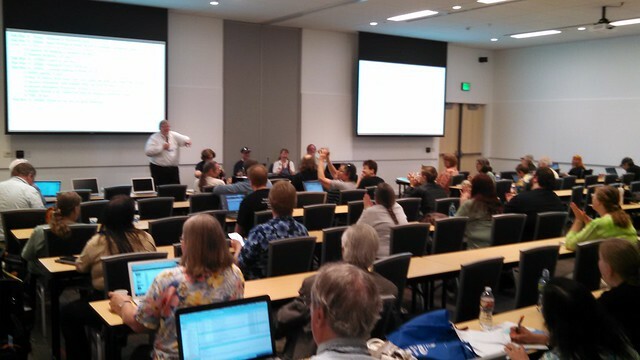 Today was the third and final day of the 2015 Worldcon Planning Meeting in Spokane. There was much less walking involved today, at least until the meeting was over. Today's meeting was in Room 302AB of the Spokane Convention Center. You can see here that the rooms have built-in data projectors and screens, as do most programming rooms. There are places to plug in computers to the projector ports built into the walls. We went through many important things about the convention, including major timeline issues, sequencing of move-in and move-out, and other details. During break-out sessions, people connected with other areas with whom in-person communication with its higher bandwidth was very useful. For example, in a five-minute discussion with the head of tech services, Lisa and I got much more useful information that might have taken a lot of e-mails; with the questions we had settled, I could follow up with a single e-mail to tech along the lines of "Per our conversation..." to remind them what we discussed. I'm feeling better about a number of things over which I was fretting before. For lunch, Lisa and I joined Cathy Mulligan and Linda Deneroff in walking to Sushi.com, a nice Japanese restaurant located about three blocks from the Convention Center. Lisa was very pleased to be able to get made-to-order sushi that wasn't full of wasabi. The final afternoon session went pretty fast, and people were leaking away to catch their flights home, so we wrapped up early and finished the day with individual ad hoc breakouts. Just before the security guards shooed us out, Lisa and I got The Camera and shot some test footage in 302AB that I will post later. Unfortunately, the layout of the convention center is such that we couldn't go take an extra look at 300AB, the space where the WSFS Business Meeting will be. I'll be writing more about that space later and our seating (and standing) plans. 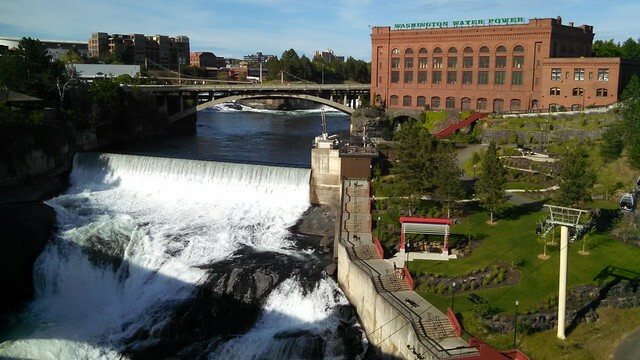 After the meeting, Laurie Mann asked if anyone wanted to go ride the Riverfront Park Skyride, an cable-car ride that gets you up close to the Spokane Falls. Lisa and I wanted to do so, and after we dumped our stuff back in the room, the three of us walked down the riverfront trail (dodging college graduation ceremonies that had been taking place in the IMG theatre this afternoon) to the Skyride. Unfortunately, the ride was having some sort of mechanical problem and was closed early. Laurie suggested we walk across the bridge above the falls, and we were happy to do so. More photos are in the Flickr photoset of which this photo is a part. After getting the photos, we walked back up the other side of the river, re-crossed, and walked back to the Doubletree. Our timing was good, as about the time we arrived, Don and Jill Eastlake (with whom we had previously discussed dinner plans) arrived, having returned from their hotel, the Red Lion at the Park. The five of us initially decided to walk to Luigi's based on our recommendation; however, as there was a loud wedding party taking up the place, we balked at that and went to our second choice, Hill's Restaurant & Lounge, where we'd eaten lunch yesterday with Tom Whitmore. Things were quiet on this Sunday evening, and the owner seated us in their private dining room (which is good for up to sixteen, he said). Lisa had the salmon linguini that I'd had yesterday, and I tried the shrimp creole, which was good, but I wish I'd had the salmon again. The Scotch eggs and battered mushrooms were excellent appetizers, and we'll definitely consider another return visit. Returning to the Doubletree, we lounged around for a while before retiring to our respective hotel rooms. Lisa and I were happy to get back to the room before 9 PM where we could relax. I logged another 14K steps today, and my feet have blisters. I need to remember to pre-tape the toes that are prone to blistering when we get to Worldcon itself. Also, after a weekend of convention-center walking, we've learned better routes to the places we need to be, particularly discovering that the most efficient route from the Doubletree to the Business Meeting is not via the convention center skybridge, but to go to the ground floor, out the side door, and through the parking garage on the ground level, as the 300AB room where WSFS will hold forth is on the ground level with doors opening onto the riverside. It was a tiring but productive weekend here in Spokane, and I'm feeling much better about many aspects of the convention now that many of us had a chance to talk things through in person and to look at the space in person, rather than through e-mail and floor plans.